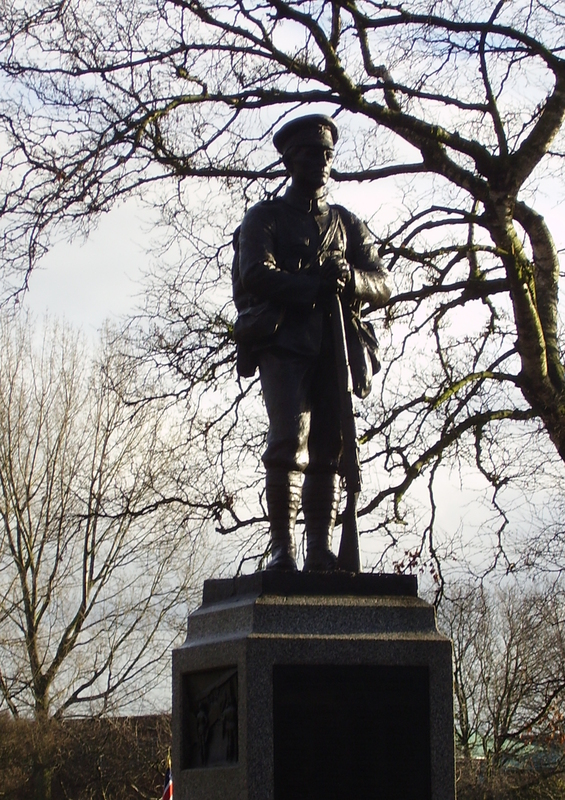 Heath Town Park War Memorial. Son of William H. and Mary Ann Cheesman of 36 Bank St. Park Village. Died of Wounds 24 November 1915 age 19. Grave Reference: XVII. C. 5. Husband of Edith Cooper of 5 Bickford Rd. Fallings Park. He was born in 1892 at 205 Wolverhampton Road Heath Town the fourth of seven children of William Henry Deakin and his wife Elizabeth nee Wildman; he enlisted at Newport Monmouthshire 1914. Killed in Action 8 September 1916 aged 24 during the battle for High Wood Somme. Edge, Harry Gunner 45647 13th Siege Battery Royal Garrison Artillery. Killed in Action 27October 1914 aged 24. Enderby, Charles Lance Bombardier 88983 169th Siege Battery Royal Garrison Artillery. Grave Reference P. IX. N. 1B. ST. SEVER CEMETERY EXTENSION, ROUEN. Emery, John Private 203758 4th Bn Lincolnshire Regiment. Fletcher Joseph Henry Sjt 3608 “C” Coy 2/6th Btn South Staffordshire Rgt Died (Ireland) 27/4/16. Francis Alfred Gunner 66394 “C” Bty 295th Bde Royal Field Artillery KIA 21/18. Gough Joseph Pte 11588 2nd Btn Royal Scots (Lothian Regiment) KIA 29/12/14. Gough Thomas H.C. Pte 38641 1st Btn Lancashire Fusiliers KIA 28/8/18. Green John Thomas MM Pte 241725 2/6th Btn South Staffordshire Rgt DOW 18/7/18. Griffiths John Stanley Pte 94457 “C” Coy 1/6th Btn Notts & Derby Rgt KIA 3/1/18. Hall William Samuel Pte 13097 1st Btn South Staffordshire Rgt KIA 1/7/16. Harper Norman Pte PO/16384 2nd R.M. Bn. R.N. Div Royal Marine Infantry. Died 26/10/17. Hayward William Glenfred MM Pte 10045 2nd Btn South Staffordshire Rgt KIA 30/11/17. Hickman Frank Norwood Pte 21883 6th Btn Duke of Cornwall’s Light Infantry KIA 18/8/16. Higgins Esau L/Cpl 23841 8th Btn South Staffordshire Rgt KIA 12/10/17. Hilditch Joseph William L/Cpl 241075 1/6th Btn South Staffordshire Rgt KIA 24/6/17. Hill John Henry Pte 12274 8th Btn South Staffordshire Rgt DOW 21/2/17. Son of Isaac and Martha Ann Hinks,of 84,Milton Rd.,Wednesfield,Wolverhampton. Hopwood Ernest Henry Pte 18753 2nd Bth South Staffordshire Rgt KIA 30/5/16. Hopwood Harry Pte 9755 2nd Btn South Staffordshire Rgt KIA 25/9/15. Horne Robert Pte 12675 4th King’s (Liverpool Regiment) KIA 27/4/15. Howell Albert Rifleman S/14298 12th Btn Rifle Brigade KIA 12/2/16. Hurlston John Pte 7759 1st Btn South Staffordshire Rgt KIA 26/10/14. Jones Matthew Henry Pte 015978 18th Ordnance Corps R.A.O.C. Died 26/12/17. Marsh Thomas Pte 8496 1st Btn South Staffordshire Rgt KIA 7/11/14. Millington Edward Thomas Pte 260143 5th Btn Yorkshire Rgt DOW 11/11/17. Ricketts Godfry Pte 2861 1/6th Btn South Staffordshire Rgt DOW 14/415. 1/6th Bn South Staffordshire Regiment. Born and resident in Wolverhampton, son of Sarah Ann and William Roberts. Died in Military Hospital Rouen 26 October 1918. Grave Reference: S. II. T. 24. 165th Bty. 26th Bde. Royal Field Artillery. Born at Heath Town. Son of Robert Frederick and Eliza Rooke, of 174 Wednesfield Rd, Wolverhampton. Died of phthisis 2 June, 1920 age 19. Ryder Joseph Pte S/21560 8th Btn Seaforth Highlanders KIA 2/8/17. Son of the late Dr. and of Mrs. Irwin Scott, of 18, Denmark Villas, Hove, Sussex. Came over from California, 1915. Accepted O.T.C., failed from heart trouble. Worked at munitions till March 1918, joined as private, although exempted. Smith William Gunner 201942 504th Bty Royal Field Artillery Died (Home) 11/11/17. Stonier William Pte R4/063980 2nd Base Remount Depot Army Service Corps Died 20/7/18. Summerhill John Joseph Pte 11643 1st South Staffordshire Rgt DOW 30/5/16. Born in Birmingham, enlisted at Armoury House, resident in Wolverhampton. Son of Councillor S. Tatton, J.P., and Mrs. M. E. Tatton, of 54, Milton Rd., Heath Town. Killed in Action 9 October 1917. BUTTES NEW BRITISH CEMETERY, POLYGON WOOD. Born and enlisted in Heath Town, son of Harry and Mary Wenlock. Died of illness 21 February 1917. His father Harry died of wounds in France and his cousin Joseph Blakemore (commemorated on this memorial) died of illness at home. Harry was born in 1873 at Wheaton Aston the son of William and Mary Wenlock (nee Brew). He was married to Emma Theresa Blakemore. Before the war he served with 2nd Bn South Staffordshire Regiment and rose to the rank of Sergeant, he was a military reservist when war broke out. He worked as a mine overseer at a Ginny pit in Deans Road though he still returned to Wheaton Aston to help with the harvests. Due to his mining experience he volunteered at the age of 41and joined the 170th Tunnelling Company. He won his DCM for conspicuous gallantry and devotion to duty on the night of 21-22 August 1915 at Cuinchy when he sank a shaft knowing the enemy were working within a few feet of him and 12 men had already lost their lives in the same mine. Harry died of his wounds 21 May 1916 after receiving his wounds in action a few days earlier. Grave Reference I. M 26. His son Frank died of Illness serving while serving in Mesopotamia, and his nephew Joseph Blakemore (commemorated on this memorial) also died at home of illness. Born at Stafford son of William and Harriet Wenlock nephew of Harry Russelbury Wenlock, resident in Heath Town. The 1911 census records William as a 22 year old soldier serving with 1st Battalion, South Staffs Regiment in Gibraltar. William was Killed in Action 30 October 1914 . Wildig Harry Richard Pte 21287 9th Btn Lancshire Fusiliers KIA (Gallipoli) 7/8/15. Yarranton Arthur Pte 36189 7th Btn South Staffordshire Rgt KIA 21/11/17.